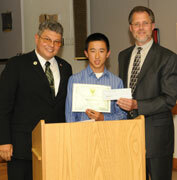 The recipients of the 2nd Annual HGCA Scholarship Awards were Nicholas Jao and James Harvey. Nicholas Jao is a graduate of Hicksville High School. Nicholas has devoted hundreds of hours to our community through the Boy Scouts of America, Natural Helpers, and Helping Hands. You can even see Nicholas shoveling the walks for his elderly neighbors after a snowstorm! He also enjoys sports as a member of the varsity soccer, bowling and tennis clubs. Nicholas plans to continue his education and become a veterinarian. James Harvey is a graduate of Hicksville High School. Jame has volunteered extensively for the United Cerebral Palsy program, the Nassau Suffolk Autism Society of America, the Empowering Long Island’s Journey through Autism, and the Autism Speaks Walkathon. His passion and countless hours devoted to improving the lives of children with special needs and his academic success in high school make James a worthy recipient of our scholarship. James plans on becoming a Special Education teacher. Pictured left is James Harvey receiving his award from HGCA President Henry Goessmann (left) and Scholarship Chairperson Ed Bossong..